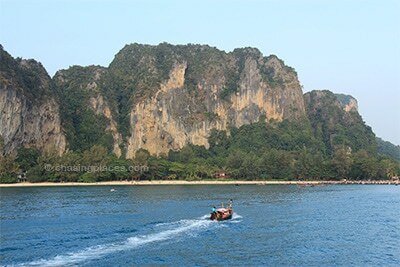 Ao Nang and Koh Phi Phi are two of the most popular tourists destinations in Thailand. This post will discuss the important steps on how to get to Ao Nang from Koh Phi Phi using the public ferry. In order to avoid the needless headaches and unanticipated transport delays we want to help you secure seamless transport connectivity between the always impressive tourist areas found in Krabi Province, Thailand. Two of these locations are undoubtedly Koh Phi Phi and Ao Nang. Dotted with stunning limestone karst formations, the ferry ride from Koh Phi Phi to Ao Nang is sure to impress even the most seasoned travelers. The steps below outline how to get from Koh Phi Phi to Ao Nang via ferry. 1. 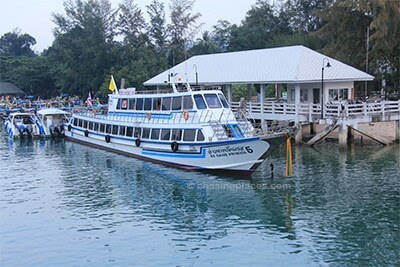 Purchase a ferry ticket from one of the various travel agencies on Koh Phi Phi Don to Ao Nang. The price will vary depending on where you buy it from, but it should range from 350-400 baht ($10.60-$12.10 US). 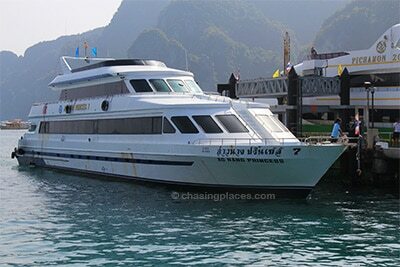 As of the time of writing, there was a daily ferry departing from Koh Phi Phi to Ao Nang at 3:30 pm. 2. Proceed to Koh Phi Phi pier 30 minutes prior to the scheduled departure time. Take note that if the ferry is already docked and waiting, the staff will allow you to board the ferry and select your seats. Nearing the end of the 2-hour ferry ride, they will make a stop at Railay Beach (before Ao Nang) in order to drop off some of the passengers on board. The long tail boats travel out from the beach to pick up passengers who wish to go to Railay Beach. 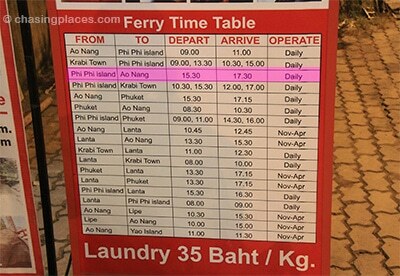 You need to remain on the ferry at this point in time if you wish to go to Ao Nang. 4. 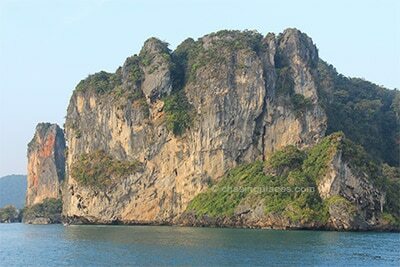 Be aware that the ferry will travel past Ao Nang beach to a pier located about 10-15 minutes away from the town proper. Once you arrive at the pier, get off the ferry and immediately proceed to one of the shuttle buses waiting in the parking area. The ferry staff and ground transport staff will ask you what hotel or guest house you are staying at. This is because they will do their best to drop you off right at your selected accommodation. 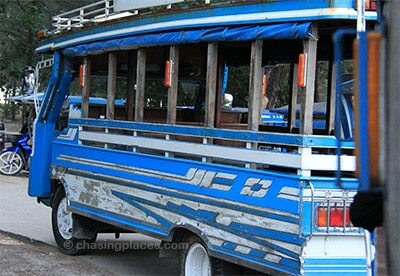 IMPORTANT: The price of this shuttle is included in the price of the original ferry ticket purchased on Koh Phi Phi. If you prefer to get a taxi, there will be some waiting there as well. 5. Ride the local shuttle and wait till you arrive at your hotel. Depending on where your guest house or hotel is located, the shuttle should take around 15 minutes to reach Ao Nang. 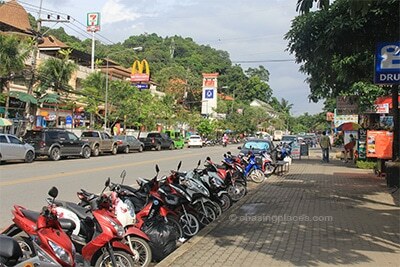 The total trip time from Koh Phi Phi to Ao Nang should take approximately 2 hours and 20 minutes. How did we find the best room deals on Koh Phi Phi and in Ao Nang? Both Koh Phi Phi and Ao Nang have a large selection of rooms to suit all budgets. The main concern on Koh Phi Phi is finding a room away from the pulsating music at night. The strategically located places often sell out early. Thanks for the concise info…will be doing this trip next week!